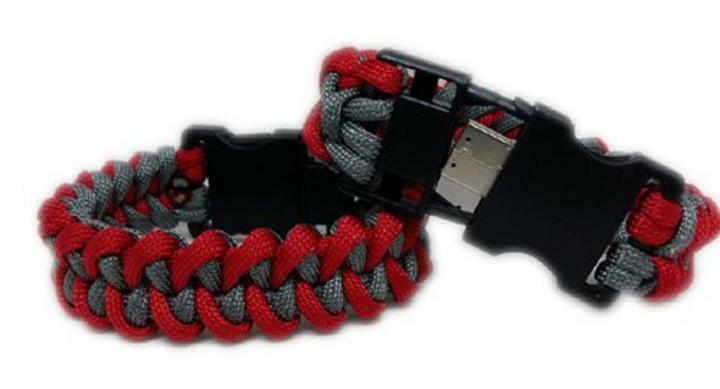 Key 2 Life ® EMR Medi-Chip USB Medi-Chip Portable EMR (Electronic Medical Records) Red and grey paracord medical id usb bracelet is 8.5 inches long.This has the medical alert star of life symbol on the front of clasp. Our usb provides critical medical information when you need it most. How often do you find yourself in a situation where medical attention is required and you DO NOT have ANY details on you for yourself and for your family? If something happens when you're away from home and outside your usual environment, that's when you need it most. In an emergency situation, critical information about you can be accessed by professionals and can save your life! If you have a medical condition or suffer from any form of allergy or illness, a Medi-chip storage device is essential to have on you at all times.